This puppy is basically another TS9, but it has clipping and gain options on "mode" switch. Modes are TS9, +, Hot and Turbo. Latter one acts as a diode lift, but adds a lot of gain. The switch is 2P4T rotary. Original unit has 250K dual gang pot for gain, and for some reason it is wired in series. So the 500K pot in its place makes this slightly simpler and the end result should be exactly the same. This sized board with a rotary switch will make it quite challenging to fit it in 1590B.. I scream, you scream, we all scream for the Tube Screamer. Pedals just don't get more legendary than this one, they don't. 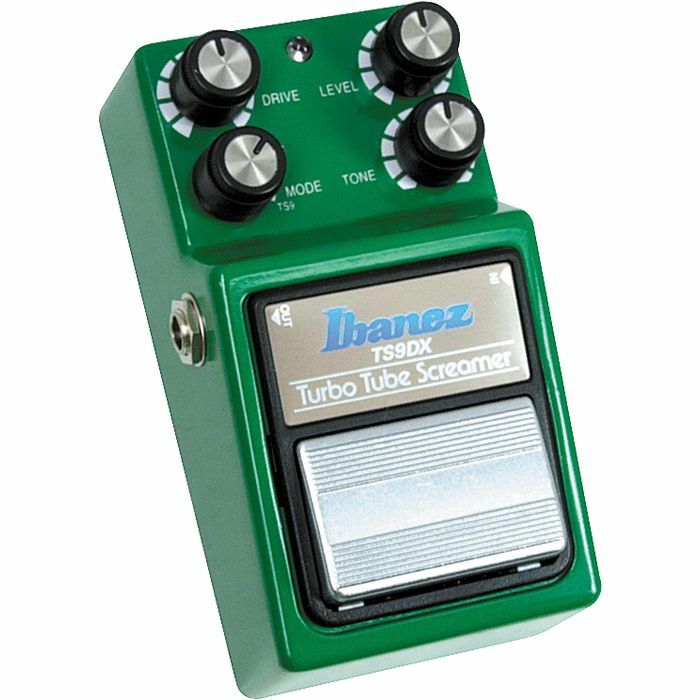 And if you're a fan of that classic overdriven tone used by... oh, well, just about EVERYONE who matters... there should be one mainstay in your pedalboard: this green-clad baby. The TS9DX gives you all the overdriven crunch, tube vibe, and smooth sustain that your tone has been asking for. And, in fact, with the TS9DX you have even more tonal options than the original. That's because the TS9DX is a special Tube Screamer reissue, loaded up with extra low-end crunch as well as "+", "Hot", and "Turbo" modes. It's like giving your guitar tone a swift kick in the face. A good kick in the face. The kind that makes you want more, and more, and more. To get all the modes, there's no alternatives. Try ebay for 2P4T rotary. Hey I have my own attempt at this. It is my first try at schematic to vero....god knows why I didn't start with something simpler. But is there anywhere I can post it for someone to scrutinize it...? any visual aids on wiring the 2p4t rotary switch? Thanks for this layout. I've now built it, although I omitted the cut to the left of the double link as I don't think that should be there. I also swapped a couple of the components based on the Keeley mods. It sounds awesome! There is one problem; in 'Turbo' mode (the fourth position on the rotary switch) there is a strange ticking/tremolo thing going on, but only with the 'Drive' over about halfway. Below this it is fine, but above you just get strange noises about once a second. Any idea what that could be? Have you boxed the board already? That sounds like your power supply playing tricks on you. If you have it boxed already, then it could possibly be the Keeley values that are trying to get too much gain out of the chip. Thanks mirosol, It's 'semi-boxed'; the pots and jacks are in, with the board outside running on a battery. I replaced the 4K7 resistor with a 3K3, with a 1K5 mounted on a toggle switch. 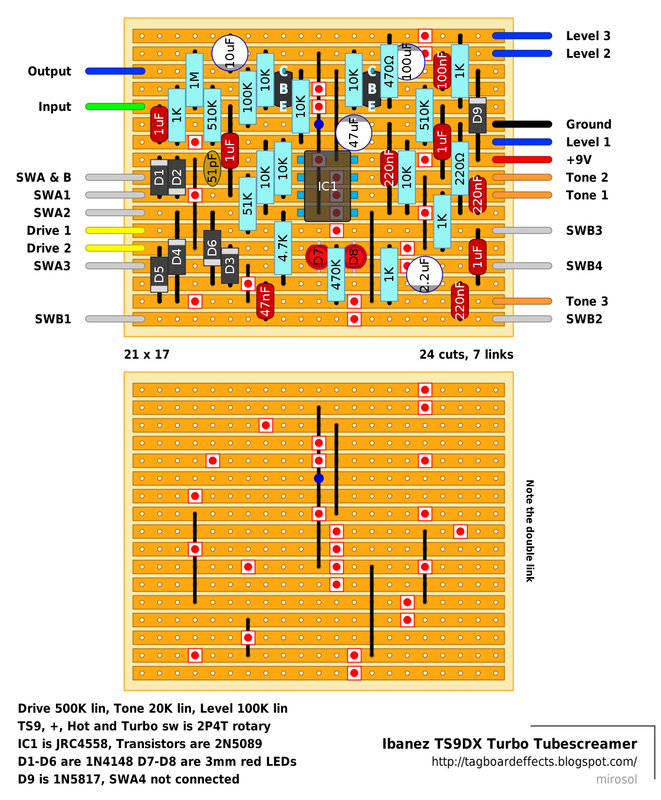 In one position the switch places the 1K5 in parallel with the 3K3, with it out of the circuit in the other position. I believe this is how Keeley does it, as per the picture I put in the forum. To see if this was too little resistance for the 'Turbo' mode, I took the 2u2 cap off the board and ran jumpers from this position to my breadboard. I put the cap on the breadboard and experimented with putting resistors after it. As I increased the resistance the sound cleaned up, but I still got the ticking/tremolo with the 'Drive' over about halfway. This was the case right up to 10K (plus the 3K3 on the vero). I've tried different batteries and different chips. Any ideas on anything else I could try? Damn, i have the same problem badoogie. so it's not down to power supply issues. i dont get it. oh and i havent modded it. it's stock, based on the posted layout. i switched in a 2262 to see if it would change anything but nope. anyone have any ideas? weirdest thing. i know that pulled diodes arent usually a problem for a screamer. i lowered the value of the 2.2uF on the turbo mode to 1uF and it works fine now. Hi Mirosol! First: Thank you! Love your site and work! The TS9DX is the pedal I always wanted to have but where I live has become VERY expensive. I know it's a lot to ask, but would you upload the schematic circuit or Multisim file? I haven't been able to find one of this pedal.